Are you looking for gorgeous, flashy with chrome, sound, and a great mover with unlimited athletic potential? Well then Candy Road is the horse for you! 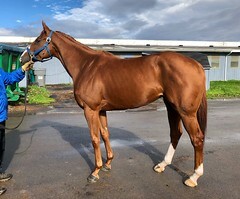 We admired this flashy filly’s substance and bone, great shoulder, strong hind end, and her pristine clean legs. Her trainer says that she can feel good in full race training (although she never does anything wrong), but that off the track on the farm she is a very mellow sweetheart, and that she is always very friendly and has no vices. 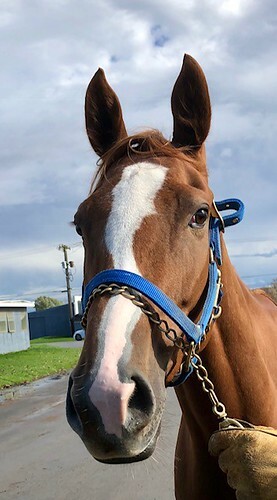 She attested to her soundness, exclaiming “there’s not a pimple on her!” Candy Road has yet to win in 9 starts, so the owner is realizing that racing may not be where her talents lie. She started her racing career on the tough Belmont/NYRA circuit, and was not competitive. 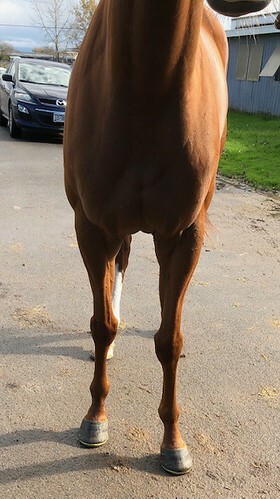 Since moving to Finger Lakes she is running well at the bottom maiden claiming level, but she is never going to set the world on fire as a race horse. But she just might be a superstar in a new sporting career! With her movement, build, and pedigree, she could excel in anything from show hunters to eventing to dressage. Candy Road was very friendly and laid back for her photo session and jogged quietly on a loose lead. And wow can she move — her trot is light, flowing, and has great reach. This NY bred filly has an outstanding pedigree for sport/jumping disciplines. Her sire is Sociano, who is by Rubiano, a son of Fappiano. His dam is from the Well Decorated/Raja Baba sire line. We know many people who covet both the Rubiano branch of Fappiano, and the Raja Baba lines — horses with great brains, kind, willing, and lots of talent. She has Storm Bird, Deputy Minister, and Majestic Prince on her dam side. We would love to see Candy competing at the 2019 RRP where we think she will be right in the thick of the competition for the lucrative award to the high scoring NY bred!